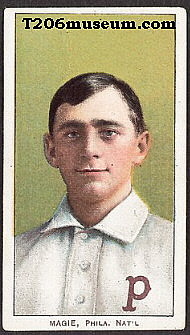 Sherry Magee was the captain of the Phillies in 1909, but that didn't keep the big tobacco companies from misspelling his name as "Magie" on their initial printing of T206 cards. There are two poses of Magee, one is portrait and the other is batting. The variation is a spelling error in the portrait pose. The error was quickly discovered and immediately corrected before the bulk of the first printing was completed in the "150 Series". It is still an unknown reason why this "Magie" error was corrected, since there were many other spelling errors in T206 that have never been corrected. 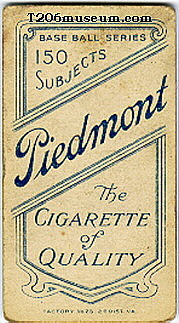 It is also important to note that this error is only known with Piedmont with Series 150 Factory 25 advertisement. This variation is one of the rarest cards in the T206 set, and competes for top-ten honors as far as value in our hobby. T206 Sherry Magie can only be found with Piedmont 150 Series Factory 25 advertisement. There are approximately 150 examples known to exist.